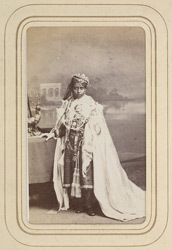 Full-length standing carte-de-visite portrait taken in the early 1870s by Bourne & Shepherd of Shah Jahan Begum, ruler of Bhopal (1838-1901) wearing the robes and order of the Star of India. The capital of Madhya Pradesh Bhopal was founded in the 11th century by Raja Bhoj of the Paramara dynasty. By the 18th century, it was ruled by the descendants of the Afghan Dost Muhammad Khan. Bhopal was unique among the princely states as it was ruled by a succession of widows; Begum Shah-Jahan (1838-1901) succeeded as Nawab Begum twice, the first time between 1844-1860 and the second time between 1868-1901. Shah-Jahan Begum was known for commencing the construction of the Taj-ul-Masjid mosque in Bhopal and for other public work projects like subsidising the cost of a railway to be constructed between Hoshangabad and Bhopal. In 1872 she was created a Grand commander of the Most Exalted Order of the Star of India.